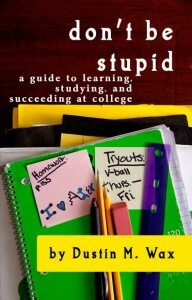 I’ve lowered prices for both paperback and e-book copies of my book Don’t Be Stupid: A Guide to Learning, Studying, and Succeeding at College! Paperback copies are not only $14.00 US (previously $17.00) and the PDF version is now only $10.00 US (previously $14.00). A version formatted specifically for Kindle is also available for $9.99 from Amazon.